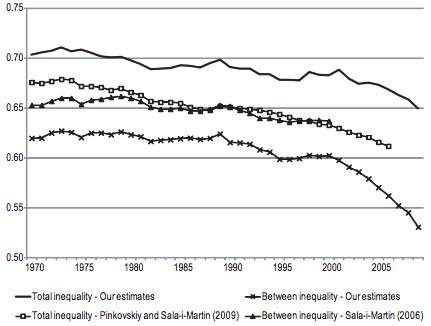 Via Overcoming Bias I spotted this paper on global income inequality, 1970-2009. Robin points out to be careful, as this doesn’t capture non-financial inequality, and it doesn’t look at the “lifecycle” of individuals – just snapshots of income dispersion at a point in time. Of course, these missing bits are due to data limitations, the authors would have known this full well. It shows the global static income inequality has fallen, especially over the last decade. Lovely. However, we only get a small part of the story by looking at that graph – the paper also decomposed changes in the global Gini coefficient into ‘between’, ‘within’, and ‘overlapping’ components. In fact, this decomposition was really the main purpose of the paper! Was Summers right in saying “pollute the LDCs”? 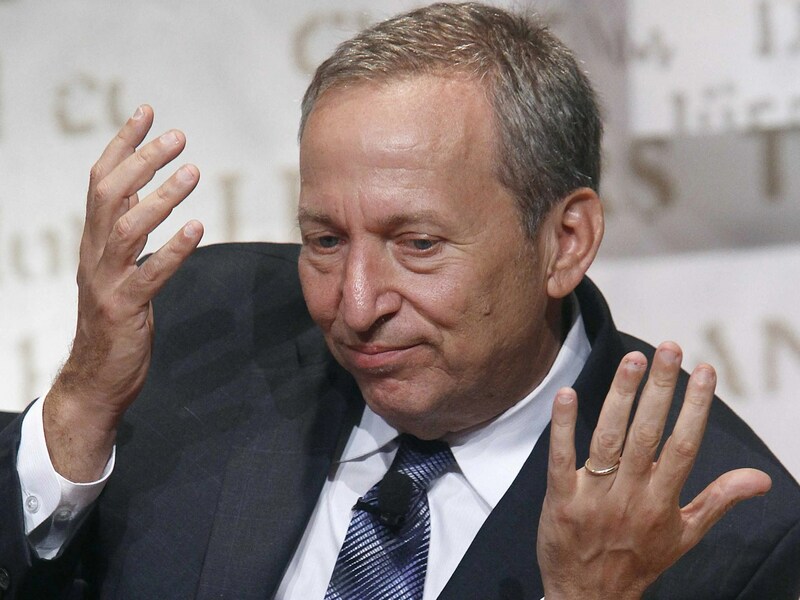 Back in 1991, Larry Summers upset a lot of people as Chief Economist at the World Bank. His memo has been viewed as morally reprehensible, was cited in the second chapter of this book as indicative of the way economists ignore moral values, and was used as a key example in a philosophy class I sat in of the untenable nature of economic arguments. But, as a description of what would happen if people in LDC’s (least developed countries) had the choice, was he actually correct? http://www.tvhe.co.nz/wp-content/uploads/logo-for-enfold-photoshop.png 0 0 Matt Nolan http://www.tvhe.co.nz/wp-content/uploads/logo-for-enfold-photoshop.png Matt Nolan2013-10-10 08:00:292013-10-10 08:10:38Was Summers right in saying "pollute the LDCs"? Doesn’t that sound grand – if the richest 100 people in the world gave up a quarter of their income then SLAM poverty gone. Ez. However, this isn’t quite right. 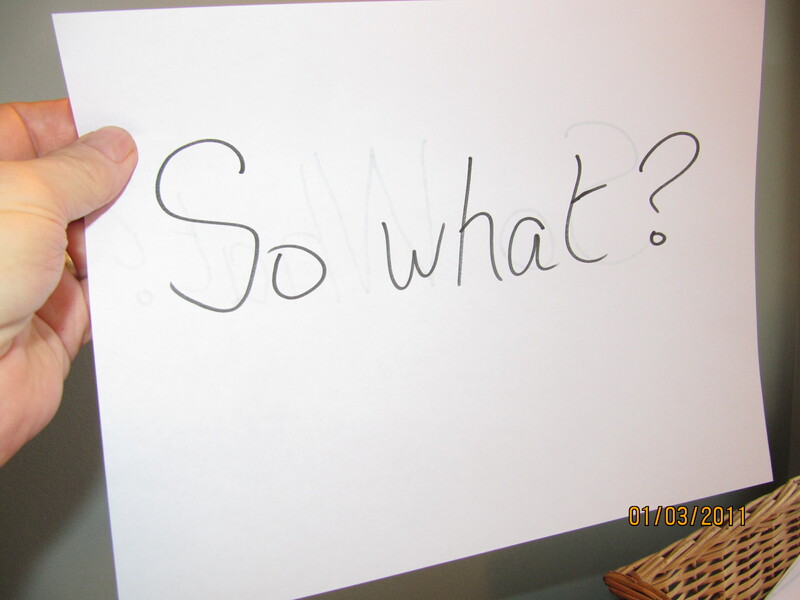 In fact it is very much not right. Via Matt, the topic of Social Capital (SC) was recently raised, with some emphasis placed on recognising its oft-ignored “dark side”. Now, I am by no means an authoritative voice on SC, but I have done a bit of work in the past looking into specific Microfinance Institutions (MFI’s) who employ an SC based approach to their micro credit lending strategies. To this end, Matt has kindly invited me to briefly blog about SC within this context, and hopefully, get us thinking a little more about how the drive for increased SC may not always result in sunshine and rainbows at the end of the day for all involved. Just a bit of conceptual grounding first as I’m well aware that a universally accepted definition of SC is an elusive beast, and from my own experience that this non-specificity often leads to confusion both within and between the social science disciplines when discussing the perceived value of SC (why it’s of worth (or not), or if it’s even a thing at all). As this is an economics blog, and not a sociology journal, I don’t really want to get into this debate. Instead, I will rely on how MFI’s themselves (by in large) equate SC for framing purposes– namely that social networks between individuals within a community hold implicit and explicit economic value. We need good time series data from developing countries to see whether the distributional impact is bigger there than what we find for Australia. Until then, the analysis here seems timely and relevant, not just for Australia, but for all resource-rich developing countries as the price volatility experienced by the former since the late 19th century was greater than that for the average commodity-exporting low-income country. The distributional impact of commodity-price shocks in Australia (Canada and New Zealand) should yield important lessons for primary producers from the developmental south. Faced with a trade union exercising monopoly power and raising the wages of its members, most economists would advocate removing or limiting the unions’ ability to exercise this monopoly power, and this is certainly the right policy in some circumstances. But unions do not just influence the way the labor market functions; they also have important implications for the political system. Historically, unions have played a key role in the creation of democracy in many parts of the world, particularly in Western Europe; they have founded, funded and supported political parties, such as the Labour Party in Britain or the Social Democratic parties of Scandinavia, which have had large impacts on public policy and on the extent of taxation and income redistribution, often balancing the political power of established business interests and political elites. Because the higher wages that unions generate for their members are one of the main reasons why people join unions, reducing their market power is likely to foster de-unionization. But this may, by further strengthening groups and interests that were already dominant in society, also change the political equilibrium in a direction involving greater efficiency losses. This case illustrates a more general conclusion, which is the heart of our argument: even when it is possible, removing a market failure need not improve the allocation of resources because of its impact on future political equilibria.